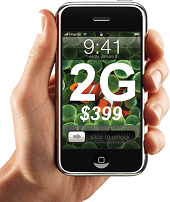 The cheaper 3G iPhone actually costs more! Published June 16th, 2008	in Money Saving Tips. 2 Comments	Tags: Apple, iPhone. This is a perfect example of how marketing works magics with numbers. You probably heard that Apple is releasing a new version of their popular phone. The support for 3G and built in GPS are the major upgrades. The cool part is that the phone will cost you $200 less, if you trust the PR nerds from Apple. Does this mean the 4G will be free but really cost an arm and a leg? I can’t believe marketing would spin something this important! You can’t blame AT&T for subsidizing the cost of the phone and making it up with increased data rates. It’s cheaper than most unlimited 3G plans out there, and you are getting an incredible phone for $200. Personally I am not getting it, since I already have the 2G model and don’t see much reason to upgrade for slightly faster data, GPS and increased phone bills! The real excitement is the 2.0 firmware and all the 3rd party apps that will come with it!